I wonder if John Kerry has ever talked to the Palestinian man in the street?? This past weekend I visited the West Bank (or if you prefer, Judea and Samaria) through my participation in the Israel Government Fellows program run by the Menachem Begin Heritage Center in Jerusalem. For two days, the Israel Government Fellows enjoyed informative meetings with Palestinian Arabs and Jewish settlers. We visited Hebron, Efrat, Shilo and Eli. To add some perspective, few believe that Efrat wouldn’t be annexed to Israel in a two-state solution. Eli, in contrast, is a very controversial settlement. While I learned much, this sojourn reminded me how easy it can be to make assumptions when looking at the Arab-Israeli conflict as an outsider. One Palestinian we met in the West Bank works as a field agent for B’Tselem-the Israeli Information Center for Human Rights in the Occupied Territories. He was born in a refugee camp and has spent time in Israeli prison. Nevertheless, he confided in us that he was terrified of what form a Palestinian state in the West Bank might take. He implored us to look around at the rest of the Arab World. In terms of government, how would sovereignty impact the West Bank’s current reasonably transparent democratic elections? Is it so hard to believe that a truly autonomous government in the West Bank won’t quickly turn autocratic? Few in Gaza can safely and publicly decry Hamas and even under occupation, one could plausibly argue that West Bank Palestinians currently enjoy greater access to protest than say, Arabs living in the newly formed regimes of Egypt or Tunisia. Compared to their counterparts in the rest of the Arab World, Palestinian women are among the best educated. Though women may not be able to drive in Saudi Arabia, Palestinian women are making a splash in headlines as the first Arab women in the world to race on the international motorsport circuit. While Palestinian women are leagues ahead of their counterparts from other Arab countries in terms of gender equality, it’s anybody’s guess what turn this trend would take in a future Palestinian state. Economically, the picture is also uncertain. Consider that in recent years, despite the intense monitoring by the NGOs and governments which pump foreign aid into the West Bank, most Palestinians are very pessimistic about the corruption and nepotism which permeates the PLO, and its management of the economy. Interestingly, according to a 2011 World Bank report, Palestinians actually perceive greater levels of corruption than actually exist. The question is once a truly independent state emerges in the West Bank, will this acute perception of corruption become more or less justified? I am certainly not arguing that Israel does a better job governing Palestinians than the Palestinians could do themselves. All peoples have a right to self-determination. I only wish to share my realization that not all Palestinians would be equally thrilled if Israel withdrew from the West Bank tomorrow, or even at the conclusion of a successful peace agreement. I don’t doubt that Palestinians find Israel’s presence in the West Bank brutal or repressive, but they also have no illusions about the shortcomings of their own leadership. I am not writing this to push a political agenda. In fact, I believe a two-state solution is in Israel’s best interest. My point is that before my foray into the West Bank, I had been under the assumption that all Palestinians were hoping to have a state of their own as soon as possible. Most Western news outlets certainly make it seem that way. When Jewish settlers in the West Bank told me that Palestinians don’t really want their own state, I balked. Who wouldn’t? But hearing the same story from a Palestinian claiming to speak for many of his Arab peers who (for the time being) are content with the status quo was powerful stuff. I am still unsure of what to make of the whole experience but I am reminded that when it comes to the Middle East, assumptions, particularly from Westerners, have no constructive role in conflict resolution. If a majority of both Palestinians and Israelis are more or less content with things as they are now, finding a solution to this conflict seems an unlikely prospect as ever. To make real progress, the world will need some of its most brilliant minds put to the task and I encourage anybody reading this to ask the difficult questions and get involved. However, I would advise you to leave your assumptions at the door and be prepared to have your point of view shaped not by mainstream media, but the people who live and breathe the conflict daily. Don’t hear. Listen. You, like me, might just be surprised by what you learn. The long period of relative quiet since Operation Pillar of Defense has been slowly dissolving into rocket fire, which reached its peak this week when the Islamic Jihad fired rockets at Ashkelon in the dead of night. If not for the Iron Dome missile defense system, the results (both in Israel and in Gaza) would have been dramatically different. Like many times before, the background to the rocket attack was infighting between Hamas and the Islamic Jihad, and, like many times before, Israel paid the price. In the meantime, Hamas is already preparing itself for the next round of fighting with Israel: Concealing long-range rocket launchers under residential buildings, building advanced underground tunnels costing around a million dollar each. Hamas' security forces are already spread out along the main roads leading to the border fence with Israel, this time in an attempt to prevent further rocket fire at Israel. A well-informed source in Gaza said that Hamas has deployed hundreds of forces and has recently sent reinforcements. Israel, for its part, has returned to its old policy of direct assassinations of rocket launchers, and thus, Ahmad Saad, the Islamic Jihad operative responsible for the rocket fire on Ashkelon, was seriously wounded after an IDF rocket hit him along a Gaza street. Much the same way, the man responsible for launching rockets at Israel during Sharon's funeral found his death through a direct IAF attack. Although Hamas is working to prevent any further rocket fire, it hasn't stopped them from maintaining somewhat of a revolving door policy in which terrorists from rival factions are arrested, taken in for questioning and then released after a short time. Quiet or no quiet, Hamas is still licking its wounds and learning its lessons from the previous bout with Israel, all the while working to strengthen itself in anticipation of the next round. Hamas has at its disposal an impressive cache of Gaza-produced M-75 rockets that can reach all the way to central Israel. As part of its lessons from Operation Pillar of Defense, during which the IAF destroyed the majority of Fajr rocket launchers and the semi-submerged launch pits from which they were fired, Hamas decided to hide their launchers next to sensitive facilities that could serve Hamas in its public relations battle with Israel, creating a guise according to which Israel is attacking civilian infrastructure. In addition, Hamas is hiding its rockets under multiple-story buildings and inside of them, sharing the space with its military wing. The group has set up cameras on the top of minarets and water towers in a bid to gather intelligence and also put Israel in a bind: Should Israel destroy a mosque, the image would probably make newspapers around the world. But Hamas is also burrowing, building an impressive web of underground tunnels throughout the strip. 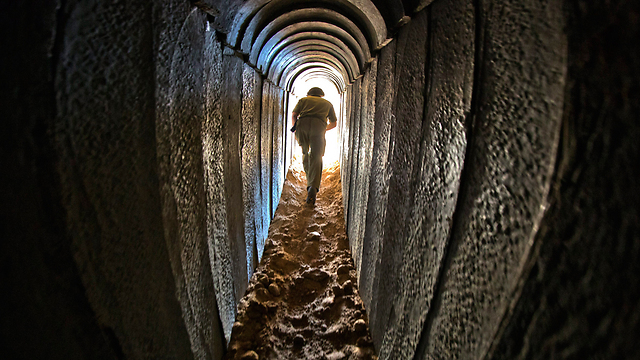 The tunnels are supposed to hide Hamas' leadership and facilitate the speedy transfer of operatives during fighting. The tunnels are currently being built and the sources in the strip believe that some of them will end under Israeli territory, like the tunnel found near Kibbutz Ein Hashlosha - which began near Khan Yunnis and popped up some 200 meters into Israel territory. The effort being put into these tunnels is big both in terms of energy and money. Each one of these tunnels costs the terror government more than a million dollars. BEDOUIN MYTH #4 – ARE THE BEDOUIN NEGLECTED BY THE STATE IN TERMS OF BUILDING RIGHTS. WRITTEN BY REGAVIM ON DECEMBER 18, 2013. Over the years, the State of Israel has established plans in order to settle the Bedouin in towns connected to infrastructure (electricity, water, and sewage), educational and medical facilities. Towards this end seven Bedouin towns were established, later the State executed a process of retroactively legalizing and recognizing 11 illegal Bedouin villages (referred to as Abu Basma Council towns). As of May, 2013, among the 220,000 Bedouin citizens in the Negev, some 132,000 residents are registered as living in organized, legal towns & villages. The official position paper of the Israeli Land Authority show a multiple array of enticements offered to those Bedouin who leave the numerous illegally constructed villages and move to the legal towns and cities. These enticements are given regardless of financial status or whether they have a claim to the land or not. “The enticements granted to the Bedouin include free housing lots exempt from development fees – the state grants the Bedouin, free of charge, lots on average 800 square meters per family (close to a ¼ acre). The plots are completely developed, including infrastructure for roads, drainage, sewage, electricity, water, etc. It is important to note that on these lots a Bedouin family can chose to build between 1 and 4 housing units according to their preference and need. The Bedouin family that moves from an illegal village to permanent housing in a legal town or village receives monetary compensation from the State. The average amount of compensation for those moving to permanent housing is a few times higher than the true value of the illegal structure. The amount of compensation is fixed according to the index of the ILA and can reach hundreds of thousands of shekels (NIS) per family. Until today, the state has spent around 370 million NIS ($100m) alone on development of lots for families who have moved from scattered regions in the framework of the compensation procedure. The budget earmarked for development of lots for the rest of the residents of scattered regions in the framework of an arrangement is estimated at close to 2.5 billion NIS. The figures from the authority for Bedouin settlement from May, 2013 show that despite unprecedented advantages, there are still 15,000 empty lots in Bedouin settlements, around a quarter of them after complete development, which remain desolate and unused. It is noted that despite the substantial efforts invested on behalf of the state, including new towns, residential neighborhoods, and compensation for evacuation, there has not yet been an ongoing and comprehensive follow up including verification that there is a connection between these investments and an arrangement for the Bedouin population living in illegal villages. Moreover, from population statistics it appears that from 1994 to 2013 the population living in these illegal villages grew by 20,000 residents, despite all the plans and resources that have been invested in the process. A good example of the phenomena is Lakiya. See photos above. The government provided plans for 30,000 residents and today only 11,723 residents reside there. Conclusion: The claim that Bedouin are forced to resort to illegal construction due to withholding of permits and adequate planning on the part of the authorities is far from the reality of the actual situation on the ground. The State of Israel has assigned large budgets and made every effort above and beyond what is required by the law in order to allow the Bedouin to move to legal communities. BEDOUIN MYTH #3 – ONLY 45 UNRECOGNISED VILLAGES? WRITTEN BY REGAVIM ON DECEMBER 16, 2013. The Bedouin connect this claim to 45 points on the map of the Negev (See the 45 blue dotes on the map published by the Council of Unrecognized Bedouin villages in the Negev). 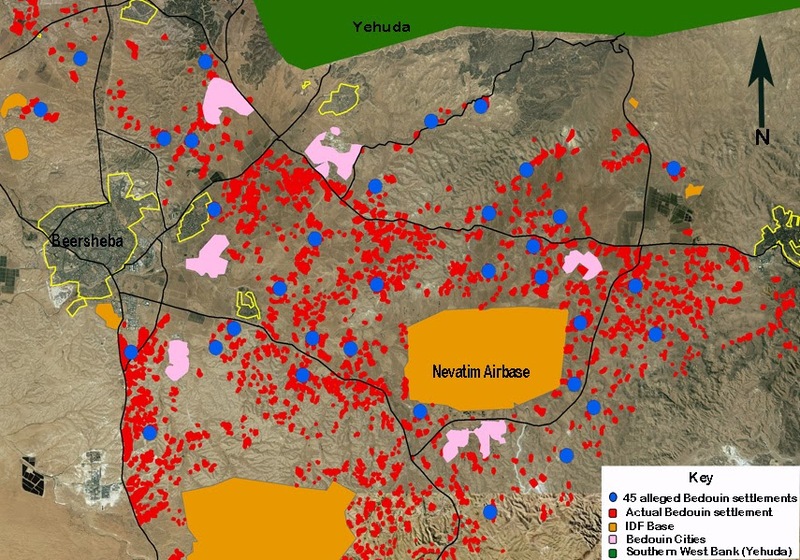 What they neglect, to tell us is that these points are attached to thousands of clusters of structures spread all across the Northern Negev, in the area between Beersheva, Arad and Dimona, creating one large contiguous territory of illegal Bedouin villages. A bird’s eye view over the village of “Al-Ara”, one of the blue dots on the previous map (south of the town of Kseifa), with the help of “zoom in” and “zoom out” functions (which can be easily replicated in Google Earth), reveals that spread across the Northern Negev are actually thousands of clusters of Bedouin residences in various stages of development. The red markings on the following photographs are polygons indicating illegal construction clusters containing three or more structures placed together. As you zoom out, thousands of these small areas merge together to create the most accurate picture of Bedouin settlement in the Northern Negev. In comparison using the points on the previous map is not an effective method to get an accurate picture of the number of Bedouin villages. The below map shows the overlay the 45 blue dots from the previous map on an aerial photo including the actual Bedouin settlement areas described above. Conclusion: Aerial photography proves conclusively that the claim of “only 45 villages” has no basis in reality. The ‘Regavim’ investigation as signified by the red layer of markings on the aerial photography points to the existence of over 2000 villages/clusters/hamlets. With security issues dominating the peace talks with the Palestinians and the on going institutionlised incitement within the Palestinian authority, what justification is there for complaints against the security barrier? Shin Bet arrests men recruited by Gaza operative working for al-Qaida chief; ‘They planned to bring foreign terrorists,’ says security official. The Shin Bet announced Wednesday that it had arrested three Palestinians from east Jerusalem who were recruited online by an al-Qaida operative in Gaza. It said the three were in the midst of preparations to carry out a string of large-scale bombing and shooting attacks on multiple targets in Israel. The intended targets included the Jerusalem International Convention Center, a bus traveling between the capital and Ma’aleh Adumim, the US Embassy in Tel Aviv, and emergency responders who would have arrived at the scenes of attacks. The Shin Bet (Israel Security Agency) said an al-Qaida operative in Gaza, named as Ariv al-Sham, recruited the men separately as three independent terrorist cells. Senior Shin Bet sources said they believed Sham received his orders directly from the head of al-Qaida, Ayman al-Zawahiri. Using Skype and Facebook, Sham was able to recruit Iyad Khalil Abu-Sara, 23, of Ras Hamis of east Jerusalem, who has an Israeli ID card. During questioning, Abu-Sara, who was arrested on December 25, admitted to volunteering to carry out a “sacrifice attack” on an Israeli bus traveling between Jerusalem and Ma’aleh Adumim. In the planned attack, terrorists would shoot out the bus’s tires, causing it to overturn, before gunning down passengers at close range and firing on emergency responders. According to the Shin Bet’s investigation, Abu-Sara also volunteered to help orchestrate a simultaneous double suicide-bombing, involving the dispatching of two suicide bombers to the Jerusalem International Convention Center and the US Embassy in Tel Aviv. Subsequently, Abu- Sara planned to detonate a suicide truck bomb in the vicinity of emergency responders arriving at the convention center. To that end, Sham and Abu- Sara plotted to bring a group of foreign terrorists to Israel using fake Russian passports and posing as tourists. Abu- Sara was meant to receive the terrorists and prepare their suicide bomb vests and a truck bomb. Abu-Sara was also supposed to travel to Syria for training in combat and explosives manufacturing. He had purchased a flight ticket to Turkey, a gateway to Syria. Abu-Sara received computer files containing virtual training courses on bomb manufacturing from Sham in Gaza, the Shin Bet added. Security forces monitored communications between Abu-Sara and Sham, observing how the latter asked his recruit which targets he had access to. After Abu-Sara suggested various targets, Sham would direct the conversation toward the operational aspects of attacks. A second suspect, Rubin Abu-Nagma, confessed to plotting to kidnap a soldier from the Jerusalem Central Bus Station, as well as bombing a residential building housing Israeli Jews in the Abu Tor neighborhood of Jerusalem. During questioning, he described how he learned to manufacture bombs online. Al-Anam, a third suspect, from Jenin, also confessed to being in Internet communication with Sham, and plotting to set up a Salafi-jihadi cell in Samaria for the purpose of carrying out terrorist attacks. Security sources noted with concern the swift process of recruitment and preparations that took place online in the space of a few months. They added that Abu-Sara’s father was opposed to his son’s activities and warned him repeatedly after seeing his son surfing radical Islamist websites. “Abu-Sara and al-Sham coordinated a trip to Syria and money transfers. This all happened very quickly,” said a source. “All three terrorist channels formed at a fast rate,” he added. The investigation underlines the fact that the Internet remains the main means of expansion for global jihadi elements, the source said. Terrorist operatives use the Internet to create operational cells, appoint local commanders, and transfer bomb-making know-how. The relationship between recruits and their handlers online is similar to relations between a cow and a calf, the source said. “The calf wants to suckle, and the cow wants to give it milk,” he added. The plots were disrupted at a relatively early stage, the source stated. They are evidence of the fact that the Gaza Strip is a terrorism base for al-Qaida-affiliated elements, in addition to Hamas and Islamic Jihad, he said. Hundreds of Salafi-jihadis in Gaza have access to rockets and arms, and travel to Sinai to attack both Egypt and Israel, the source explained. Hamas has reached an understanding with these elements, according to which they must not directly harm Hamas by provoking an Israeli response against the Islamist rulers of the Strip, but are otherwise free to act as they please. There have been no recent arrests by Hamas of Salafi jihadis in Gaza. Rather, Hamas engages with these groups by deploying its own forces to rocket-launching grounds to prevent attacks on Israel, and through dialogue with al-Qaida-affiliated elements. Outside of Gaza, Hamas supports global jihadi activities in Syria and in the Sinai Peninsula, the source continued. Hamas would prefer to avoid a confrontation with smaller terror groups in Gaza, while also avoiding a head-on clash with Egypt and Israel. The episode also underlines the risk posed by al-Qaida’s attempt to recruit east Jerusalem Palestinians, Israeli Arabs, and Palestinians in the West Bank, the source said. In November, three Salafi-jihadi terrorists who were in the middle of planning a terrorist attack were killed in a counter-terrorism mission in the Palestinian village of Yatta, near Hebron. The suspects were in a car that contained explosives and firearms, when they were intercepted by the Israel Police’s Counter-terrorism Unit. The unit opened fire at the car’s tires and the suspects fired back. Following an exchange of fire, the two suspects were killed. A little over an hour after the firefight, security forces engaged a third armed suspect, killing him as well. Meanwhile, a US State Department official acknowledged Wednesday reports of an al-Qaida plot targeting the American Embassy in Tel Aviv, telling The Jerusalem Post that the US is “closely following the situation” and has been in touch with the Israeli government concerning the matter. The official implied that the plot had been a matter of discussion between US and Israeli for some time. “The US embassy was not just the target, but obviously other targets were involved as well in the threat,” State Department deputy spokeswoman Marie Harf said on Wednesday. Harf said that the US has no plans to evacuate the embassy. “We obviously don’t discuss all of our security measures,” Harf added. UK parliament launches inquiry into funding for UNRWA. AND ABOUT TIME TOO!!! When is the world going to wake up? The British parliament has formed a committee of inquiry to probe the flow of funds used by the international refugee agency UNRWA to support the Palestinians, according to an exclusive report first revealed on Saturday by The Jerusalem Post's Hebrew-language sister publication, The Post. According to the report, the British government contributes 90 million pounds annually in aid to the Palestinians. A third of that sum is earmarked for UNRWA – the United Nations Relief and Works Agency for Palestinian refugees. 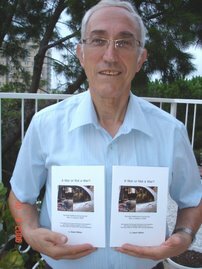 The parliamentary committee was formed in response to heavy lobbying by pro-Israel organizations and with the encouragement of former Israeli Labor MK Einat Wilf. The committee is due to submit its recommendations to parliament soon. "UNRWA is perpetuating the notion that the descendants of refugees are themselves refugees, and it is based on this principle that the Palestinians are demanding the right of return, something that will not happen in any future agreement," Wilf said. "The main point is that UNRWA is entirely supported by Western countries whose official policy is to aim for a two-state solution," Wilf said. "This is completely in contradiction to the idea of a right of return for 5 million refugees and their descendants to Israel." Dozens of Palestinian youths blocked several main roads and torched tires in the West Bank city of Ramallah last week demonstrating against a month-long strike by UNRWA, Palestinian news agency Ma'an reported. The protest against a lack of public services normally provided by the agency came as the Palestinian economy falters and while aid agencies struggle to cope with deepening refugee crises related to the civil war in Syria. On Thursday, scores of Palestinian youths blocked a main road outside the Jalazoun refugee camp north of Ramallah, as well as roads linking other camps inside the city, to vent their anger over the repercussions of the UNWRA strike. An Israeli NGO is helping Syrian refugees survive by collecting winter clothing, but has to remove all traces of its origin before sending it to the war-torn country. Operation Human Warmth was organized in response to the snowstorm last month during which 27 Syrian children died. Israeli Flying Aid launched the campaign in cooperation with two youth movements, DrorIsrael and Hano’ar Ha’oved Vehalomed. Israeli Flying Aid supplies humanitarian aid to people around the world, including in countries that have no diplomatic relations with the Jewish state. The organization does not usually publicize such actions so as not to be prevented from carrying out its missions. This time it is speaking out, in an effort to raise awareness of the refugees’ plight and to attract financial donations. The aid effort is meant to “help Israeli children understand that Syrians are in desperate need of help, and that humanitarian reasons require one to put politics aside for a while. Members of the public can bring sweaters, blankets, sleeping bags and other garments to 15 Hano’ar Ha’oved Vehalomed youth centers across the country through January 10. Members of the two youth groups are also going out and collecting the needed items. The donations will be checked to ensure the safety of the refugees who will receive them. Thus, clothing with Israeli brand names or Hebrew writing will not be accepted, and all Hebrew-language tags will be removed. Israeli Flying Aid will transfer them to Syrians in need. The NGO declined to say the supplies would be sent to Syria. Some 100,000 members of the youth groups between the ages of 12 to 18 will participate in the operation. Israeli Flying Aid plans to start another operation later this month with the Scout movement to collect dry foods and other goods to send to Syrian refugees and internally displaced persons. A Tel Aviv dog daddy and his beloved pet, Shrek, won the 3k run in the city's first-ever Doggie Run. "It was a short race for her," explains Anatoli, Shrek's owner. "Usually she runs about 10 kilometers a day." Tel Aviv is a city of dog lovers, making it a natural spot for a canine marathon of sorts. See the variety of pets and owners who turned out for the run - including a group of vision-impaired men and women with their newly trained guide puppies, and a police dog named Ochi with his handler. BEDOUIN MYTH #2 – ARE THE BEDOUIN VILLAGES HISTORICAL? In the past few years, the Bedouin of the Negev and extreme left Non-Government organizations (NGO’s) have repeatedly claimed that most of the Bedouin villages are “historical” and that Bedouin have inhabited these villages since before the creation of the State of Israel. Take, for example, the Joint Position Paper: Bill on Arrangement of Bedouin Settlement in the Negev, of May 2013, sent by the Association for Civil Rights in Israel (ACRI) and Bimkom, to the Ministerial Committee for Legislation regarding the proposed Law for the Arrangement of Bedouin Settlement in the Negev, 5773-2013. No one is denying that there were nomadic tribes living in the Negev prior to 1948, however due to the nature of these tribes, no permanent residences were established. There are signs of cultivation in the aerial photography that was examined but the form of farming used was seasonal, not long term, in order to supply feed for their herds as they moved from place to place. 4 The aerial photographs taken prior to the establishment of the State of Israel were done by the British Authorities, and then transferred to the Government Center for the Mapping of Israel, which is the source for all aerial photographs contained herein. The illegal village of Al-Araqib is situated on state lands managed by the Israel Land Authority (ILA), about ten kilometers north of Be’er Sheva. This village has been mentioned in numerous headlines, when Bedouin families who claim ownership of the land, repeatedly trespassed into the area from which they had been evicted tens of times by the authorities. According to Bedouin from the A-Turi tribe, they have lived in the area since the Ottoman period, and were evicted from the area after the War of Independence by the Israeli Army, with a promise that the eviction was only temporary. As evidence of the villages’ long history they point to a cemetery that they claim is “ancient”. The series of aerial photographs below, dating from 1945 to 2010, indicates that the reality is completely different. From a photograph taken in 1965, it is indeed possible to see the cemetery in its first stages, yet there is neither a village nor anything that looks like a village visible. In a photograph from 1956, the cemetery does not exist at all. So too the imagery from 1945, 3 years before the establishment of the State of Israel. Al-Araqib 2010 – Cemetery and village. Al-Araqib 1989 – Cemetery, no village. The area where Al-Araqib is today, in 1945 no village or cemetery whatsoever. Conclusion: The “historic” village Al Araqib, which the Bedouin claim was established during the Ottoman period, was built in the end of the 1990’s and thereafter. The aerial photos from 1956 & 1945 has disproved the claim of the A-Turi clan that this location was a village prior to 1965. The Beersheba district court accepted Prof. Ruth Kark’s analysis to this end during the trial of Al Araqib. Some other examples of so-called” historic” Bedouin villages. The above aerial photos speak for themselves, without the need for further explanations. It is fairly easy to identify the land described in the photographs when set side by side, in order to understand simply that the claim voiced day and night that "our villages were here even before the founding of the state”, is an ongoing falsity.